Cigar Aficionado’s 2017 Cigar of the Year. Occasionally, a cigar comes along that is unique in every way—interesting blend, innovative shape, intriguing story—and, at the same time, can still maintain the classic standards of excellence. This is the case with the Arturo Fuente Don Carlos Eye of the Shark, Cigar Aficionado’s 2017 Cigar of the Year. Our Mr. Ping Life Cigar World Tour has been the platform for many firsts, many cigar anniversaries, many joyful times! Since its inception, the Tour has hosted annual Arturo Fuente cigar events, and our November 2017 one was yet another big hit. 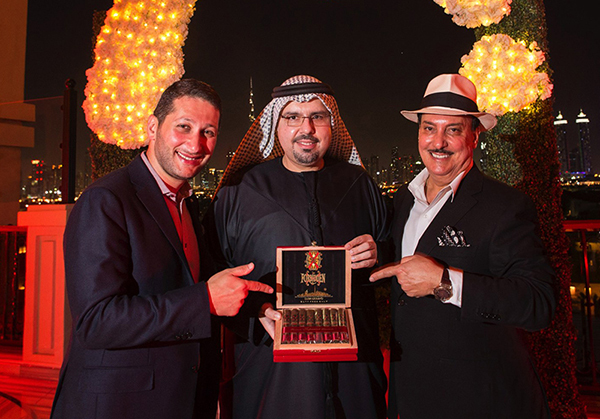 The special night, co-hosted with Allied Foods & Trading, Fuente’s distributors in Dubai and Abu Dhabi, and S.T. Dupont, was centered around the unveiling of the first ever Dubai Exclusivo, an all-new release from the Carlito Especial Reserva Limitada. As always, our dear friend Carlos Fuente Jr. was the star of the evening, welcoming everyone with positivity and fire for life. Carlito shared deep emotions and thoughts, explaining more about the Dubai Exclusivo and voicing his love for the ‘city of life’.